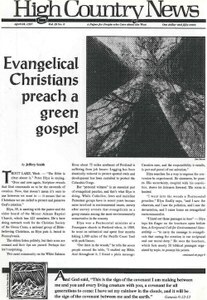 A new breed of green Evangelical Christians seeks to spread the good news of Bible-based environmentalism to their conservative fellow Christians. An evangelical pastor, who is also an environmentalist, tries to bring what some see as two conflicting worlds together. An Evangelical Lutheran pastor denounces the racial extremists of the so-called "Christian Identity" movement who have lately flocked to Montana. Quotes from Scripture about the environment. A Catholic environmentalist considers coyotes and the Creator during a retreat at a Trappist Monastery in the mountains. Two lectures, "Night of the Living Beanfield" and "Reading, Writing and Revolution" set for May 1-4 in Breckenridge, Colo.
Spring meeting of the Colorado Coalition of Land Trusts set for May 1-3 in Colorado Springs. Green infiltration of the Christian right is one topic to be discussed at the Wise Use Leadership Conference May 2-4 in Reno/Sparks, Nev.
A symposium, "Transportation Partnerships," will take place May 1-2 in Glenwood Springs, Colo.
"Wetland Restoration in the Landscape" is a conference set for May 5-7 in Corvallis, Ore. The 1996/97 edition of the Pacific Northwest Environmental Directory is a good resource for job-hunters, researchers, etc. Wyoming produces a draft wolf-management plan allowing for six wolf packs to move outside Yellowstone's boundaries. Cows cause fires; cow-car catastrophe; getting gross w/pukey tobacco in AZ. ; John Birch conspiracy mongers in WY. ; Moab survives spring break; resourceful lost 8-yr.-old in Arches; invading rattlers and depressed alpacas; "Habitat Drive" near Telluride. Big Sky apology, reader surveys, research fund feedback, extravagant responses to April Fools, the Unabomber, spring intern Emily Miller. One year after a train derailment spewed chlorine gas and other dangerous chemicals, residents of Alberton, Mont., say their town is unsafe and their health still impaired. The New World Mine swap, intended to protect Yellowstone National Park from a gold mine, remains in limbo - partly because almost half of the mineral rights belong to 80-year-old Margaret Reeb, who wants to mine the gold and refuses to negotiate. Sam Hitt, a founding member of the Southwest Forest Alliance, is ousted from the group amid complaints about his extremism and refusal to compromise. Idaho's Sawtooth National Forest Supervisor Bill LeVere faces fierce criticism from Rep. Helen Chenoweth and ranchers for his crackdown on overgrazing, but so far refuses to back down. Flagrant cases of wildlife poaching inspire new legislation throughout the West to crack down on criminal hunters. The April 1 deadline for Navajos still living on Hopi Partitioned Lands in Arizona passes without the feared evictions, but the Hopis say the remaining Navajos still need to sign a lease or leave.